Versatile, juicy, succulent, summer in a bite… Simple Slow-Roasted Tomatoes require only a few minutes of active prep, and a few hours in the oven. Enjoy them on bruschetta or stirred into your favorite pasta. Heck! Eat ’em plain! 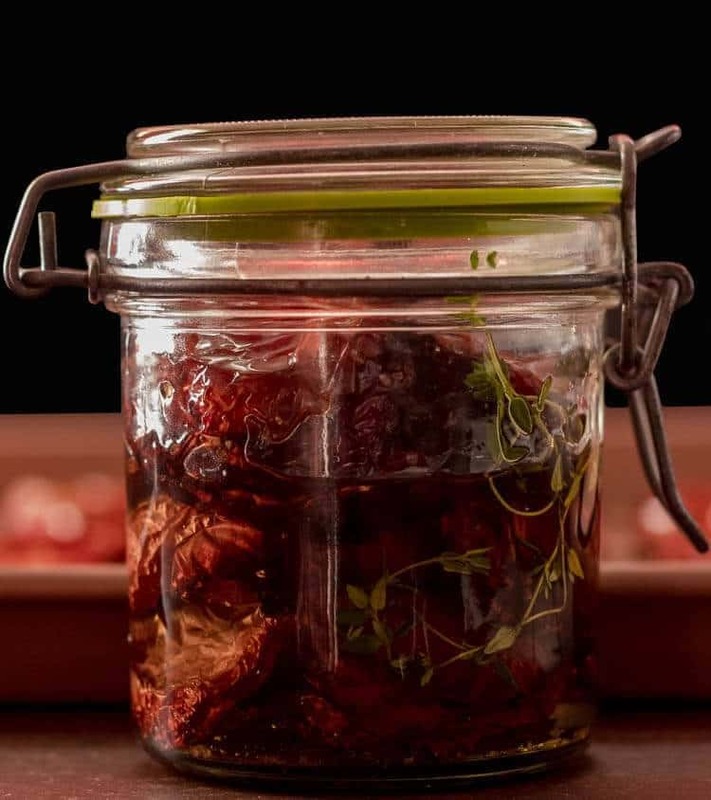 “Once upon a time,” I used the ubiquitous sun-dried tomato. They came in 2 versions: 1. Dry and leathery and 2. Soaked in oil. I loved the flavor they added to a dish, but the texture was often not pleasant. Then I discovered slow-roasted tomatoes. Slow-roasting the tomatoes intensifies their sweetness and umami flavor. Of course the caramelization adds depth and complexity. The tomatoes retain their texture, and are soft and juicy. What more can a tomato lover ask for? I typically use roma tomatoes for this project as they’re affordable and easy to prep. You know the “grocery store tomatoes” that always look like they came off the vine way too soon? Use them! This is a great way to get intense tomato flavor on the cheap. Of course you can use any tomato variety, keeping in mind the size will affect the cooking time. I keep my tomatoes simple as I use them in a variety of dishes with many flavor profiles. Just 2 main ingredients are required: Tomatoes and olive oil. I season them with Hawaiian red salt and fresh ground pepper. I may or may not pack them with a bit of fresh herbs (thyme on photo shoot day), but they’re totally optional. 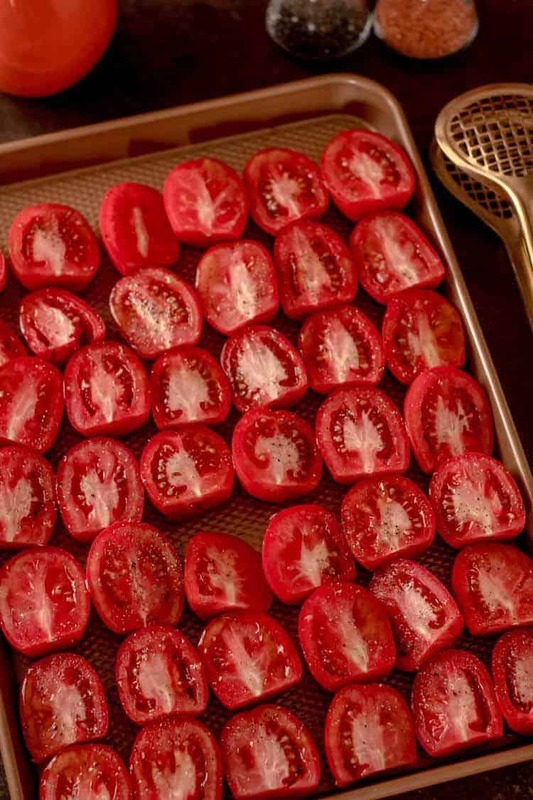 Once the tomatoes are sliced lengthwise, arrange them on a sheet pan(s). Drizzle with olive oil (you do have an olive oil drizzler don’t you?). Season with sea salt and pepper, and pop them in the oven. About 2/3 of the way through the cook time, turn them. I usually just pop them into small zip bags and freeze them until needed. Occasionally, I put them in a jar and add some more olive oil. I have found that “batch” cooking (like with my Roasted Mushroom Stock) is a really efficient use of time. I love having things like homemade stock, slow-roasted tomatoes, and Pressure Cooker Mexican Pulled Pork in my freezer ready to get me a step closer to a fabulous meal! Versatile, juicy, succulent, summer in a bite... 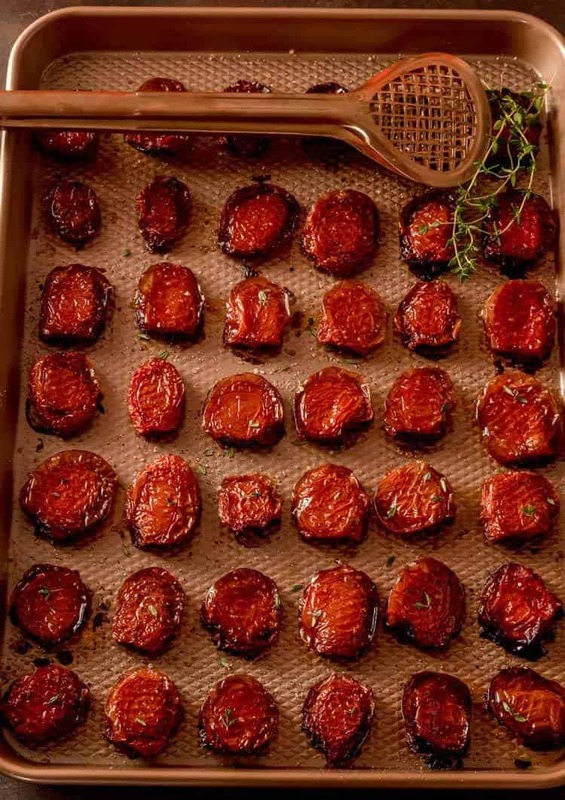 Simple Slow-Roasted Tomatoes require only a few minutes of active prep, and a few hours in the oven. Enjoy them on bruschetta or stirred into your favorite pasta. Heck! Eat 'em plain! Slice tomatoes in half. Arrange on the sheet pan. Drizzle generously with olive oil, rubbing the tomatoes around a little to coat. Place pan in the oven. After about 3 hours, turn the tomatoes. Cook another 2-3 hours to your preference. 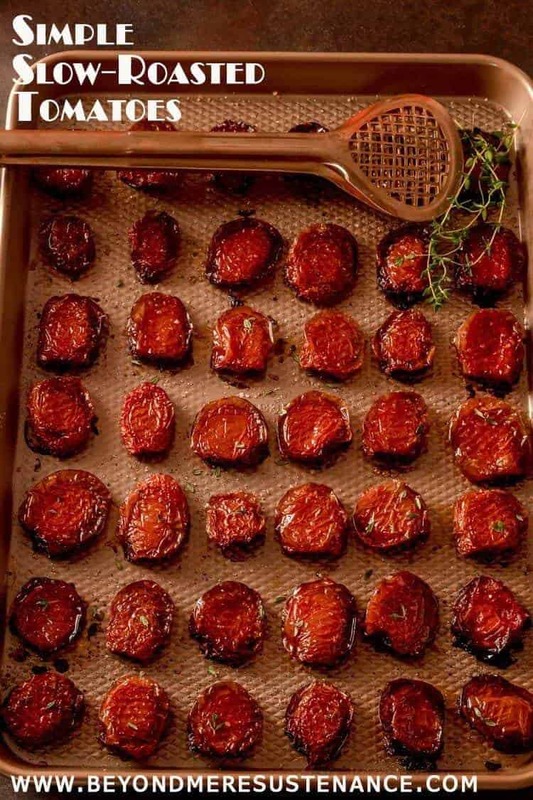 We like a lot of caramelization (as shown in the photos). Allow the tomatoes to cool. Sprinkle with herbs if desired. 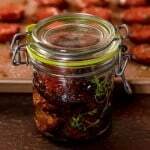 Pack in small zip bags for the freezer or in an airtight jar in the refrigerator for up to a week. I almost always use roma tomatoes because I can whip through the prep so fast. The choice is yours. Adjust cooking time as smaller ones cook faster than larger ones. If using in a salad or bruschetta, bring the tomatoes to room temperature first. If using frozen tomatoes, thaw before adding. I do this also with extra summer garden tomatoes, but I go further and dry them. That way I can keep them in ziploc bags. But I like that yours are still moist and you store them in oil Very smart. And I imagine so much better than what you can buy! What a fabulous idea! Like you, I do love sundried, but the texture can be off putting. Hopefully we'll have a bumper crop of tomatoes this year and I can put some of these up for winter soups and dishes. Good luck on the bumper crop of tomatoes MJ! I struggled with tomatoes in Las Cruces; I was successful only one summer. This would be a great way to use what you can't finish fresh! Oh lovely. I have never thought to freeze portions when I slow roast tomatoes - thanks for the tip (and for linking up to my potato skins). We can't get enough roasted tomatoes lately. But we're also impatient so I roast split cherry tomatoes on high and devour them immediately. These are really easy to make, and add a lot to recipes that call for tomatoes. They really do freeze well, too.